1. What is Embedded Analytics? Embedded Analytics refers to the integration of analytical content (reports, dashboards, data visualisations) directly within an application. User adoption of centralised BI systems has and continues to be a persistent challenge. With only a fraction of users ever leveraging some form of analytical capability, the majority of users are left ill-informed with adoption rates stagnating between 15 - 25%. This kind of makes absolute sense when you think of the expectation that is placed on consumers in order to reap any reward. User X is in the middle of working with Bus App Y and would like to analyse some of the underlying data. In order to do so, User X would need to stop what they are doing and switch over to a BI platform, usually via a centralised portal. Once complete, switch back and resume working. As you can appreciate, this is quite disruptive to the users flow, and herein lies the opportunity! Embedded analytics delivers insights directly to users, significantly increasing the likelihood of adoption while accelerating the users time to value. 3. What is Power BI Embedded? 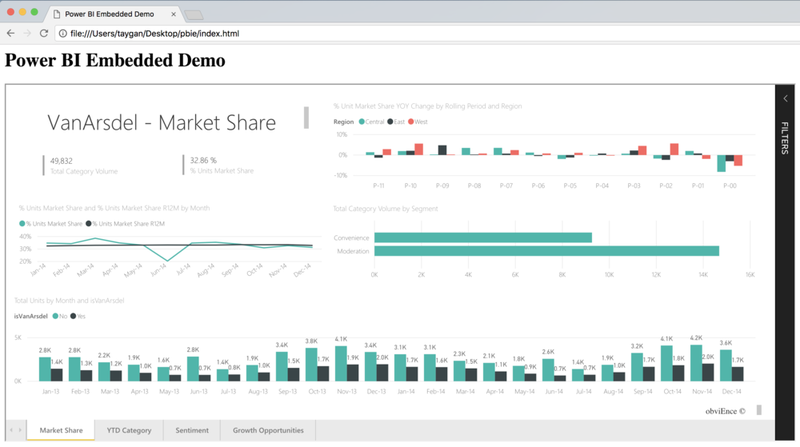 Power BI Embedded enables ISVs and developers to integrate Power BI content (reports, dashboards and tiles) directly into an application. You simply provision and pay for the dedicated capacity required to serve the content and meet peak usage demand. Each individual consumer does not require a license. There only needs to be a single "master" Power BI Pro account. The Power BI Embedded offering is targeted at ISVs and developers (i.e. building apps for external users). If you are looking to embed Power BI within the enterprise context (e.g. an internal portal, SharePoint, Microsoft Teams), the guidance from Microsoft is to look at Power BI Premium, as this SKU may be better suited when combined with existing internal usage of the Power BI service. Check out the Power BI Embedded FAQ for more info. 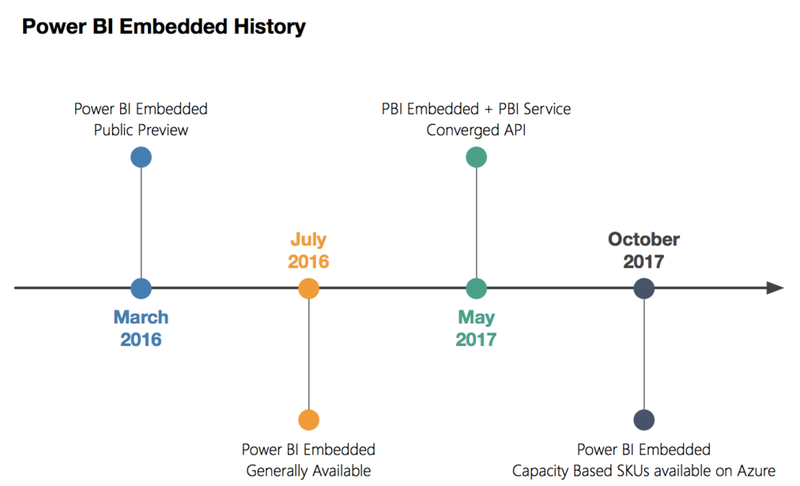 Not to dwell on the past but understanding Power BI Embedded's history to date may provide some needed clarity as the offering has evolved since its initial release. You may still see this resource in the Azure marketplace or stumble across the term in Google, this is the legacy version of the Power BI Embedded offering prior to the API convergence that occurred in May 2017. Power BI Workspace Collections are on the deprecation path and will be completely retired in June 2018. The legacy pricing model was based on sessions (current model based on capacity). Log in with your Power BI Pro account (this account should also have access to Azure). Configure your level of access by choosing the API's that you need. Note: When registering an application to access Power BI API's to facilitate Power BI Embedded scenarios, always choose Native App (even if you are ultimately surfacing the content in a web app). While the app registration form does get us about 80% of the way there, we need to grant some additional permissions via Azure to complete this step. Log on to the Azure portal. Navigate to Azure AD > App Registrations > Your Power BI App. Click Settings > Required Permissions. Click Windows Azure Active Directory, check Access the directory as the signed-in user, click Save. Click Power BI Service, check Delegated Permissions to select all, click Save. Click Grant Permissions, click Yes. Create a Power BI Embedded resource. Fill in the required property values. Note: Power BI Embedded is billed hourly. If you pause the resource, you will not be charged. Do I need Power BI Embedded capacity during Development / Testing? During development and testing, you do not need Power BI Embedded dedicated capacity (i.e. you could skip this step) as you are able to generate a limited number of embed tokens (we'll get to embed tokens later) without this resource being active. In terms of the number of embed tokens that can be generated before being exhausted, this (afaik) is undocumented. That said, generally speaking, you can live without Power BI Embedded dedicated capacity until you are ready to transition to Production. With Power BI Embedded capacity you are then free to generate unlimited embed tokens. Select the Power BI Embedded resource from the drop-down menu. Once complete, you should see a diamond icon next to your App Workspace to indicate that it is backed by premium capacity. Note: You will need to publish some content into your App Workspace (i.e. Dashboards, Reports). You can do this via Power BI Desktop otherwise clicking Get Data > Samples can quickly get you started. Navigate to your Azure Function App. Create a new C# HTTP triggered function (i.e. Webhook + API). Navigate back to the Azure Function App (parent) and click Application Settings. Navigate back to the Azure Function. Copy and paste the JSON code from below into the file and click Save. Copy and paste the C# code from run.csx below and click Save. Note: The easiest way to get the Group ID and Report ID is directly from PowerBI.com. Simply open a report from your App Workspace that you intend on embedding and you can see the values in the URL (e.g. https://powerbi.com/groups/<Group ID>/reports/<Report ID>/ReportSection). These values can also be attained programmatically but to keep this demo as simple as possible, we are going to supply them directly. That's it. To test your API, click on the </> Get Function URL link and navigate to it in your browser. The JSON response should look something like the below. Finally, our front-end code to tie it all together. Copy and paste the HTML below into a single index.html file. If successful, you should see the embedded Power BI report! That's it! In this example I'm just running the HTML code from my local machine, if you wanted to go FULL SERVERLESS, you could upload the HTML document on to Blob storage and make the container public.